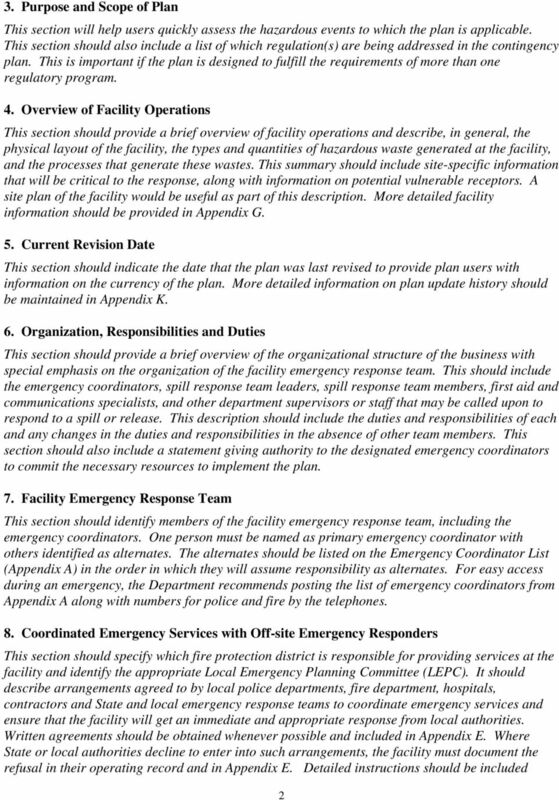 Download "Contingency Plan Template. 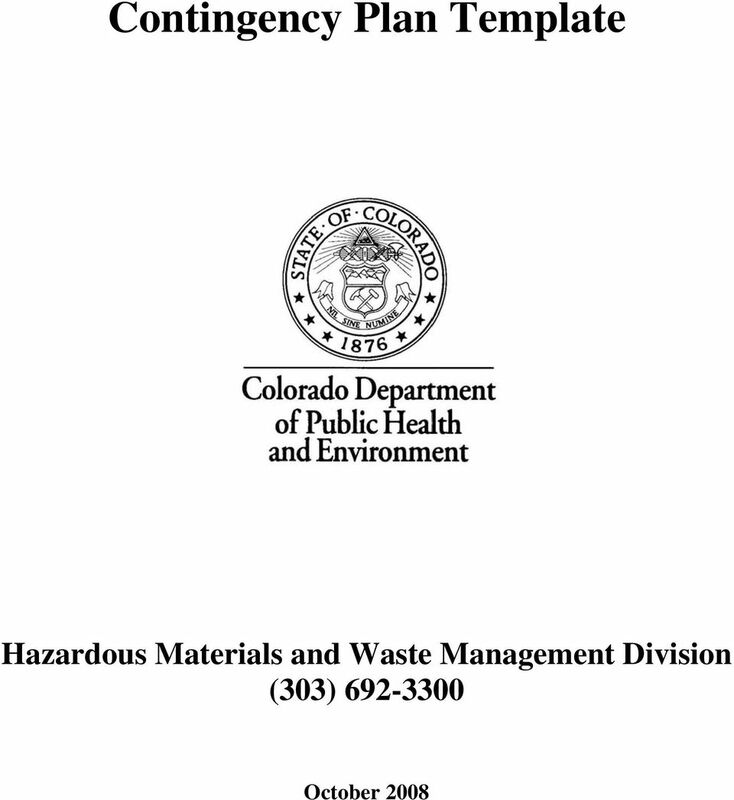 Hazardous Materials and Waste Management Division (303) 692-3300"
15 o Did you make sure that wastes that may be incompatible with materials released during the emergency haven t been treated, stored or disposed of until your facility was completely cleaned up? 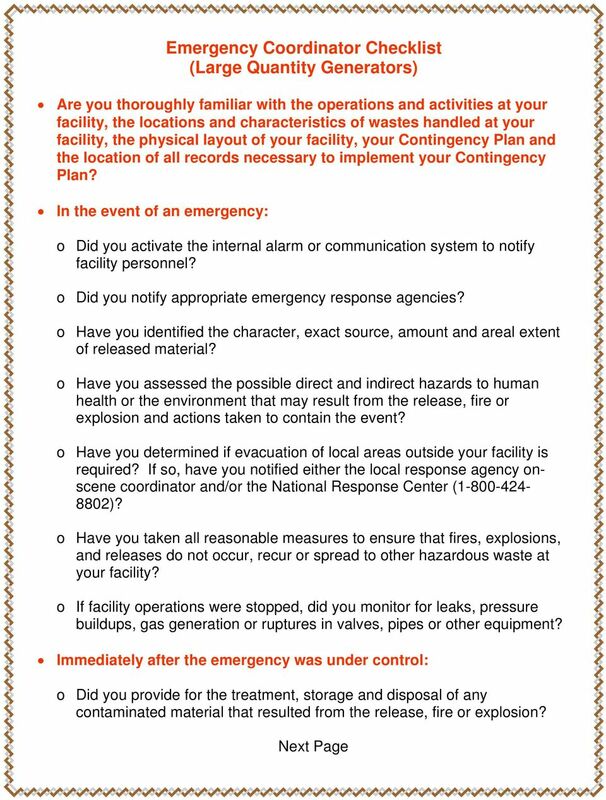 o Did you make sure that all emergency equipment was cleaned and ready for use before resuming facility operations? 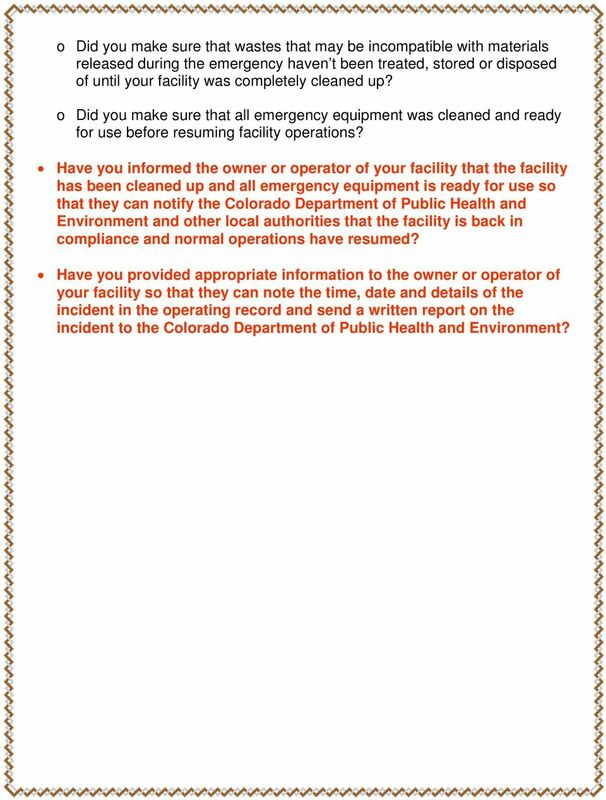 Have you informed the owner or operator of your facility that the facility has been cleaned up and all emergency equipment is ready for use so that they can notify the Colorado Department of Public Health and Environment and other local authorities that the facility is back in compliance and normal operations have resumed? 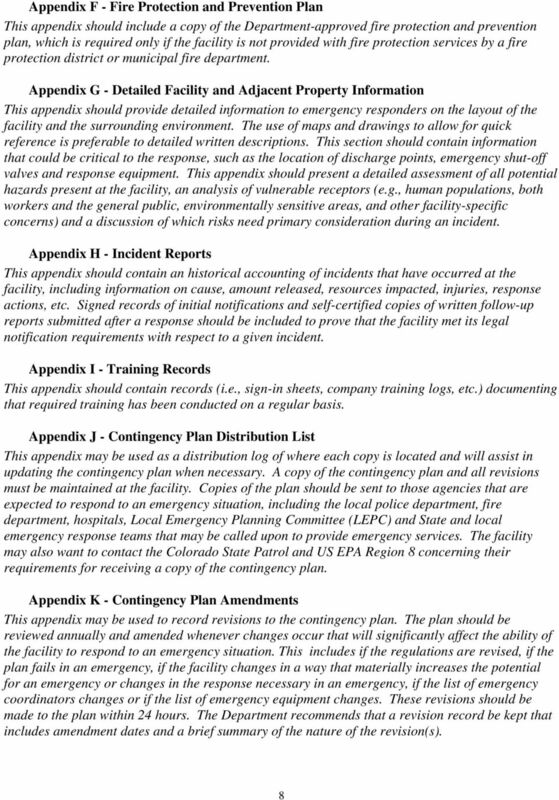 Have you provided appropriate information to the owner or operator of your facility so that they can note the time, date and details of the incident in the operating record and send a written report on the incident to the Colorado Department of Public Health and Environment? 16 90-day Area Container Checklist (Large Quantity Generators of Hazardous Waste) Are all accumulation/storage containers marked with the words Hazardous Waste? Is each container clearly marked with the accumulation start date the date waste was first placed in the container? 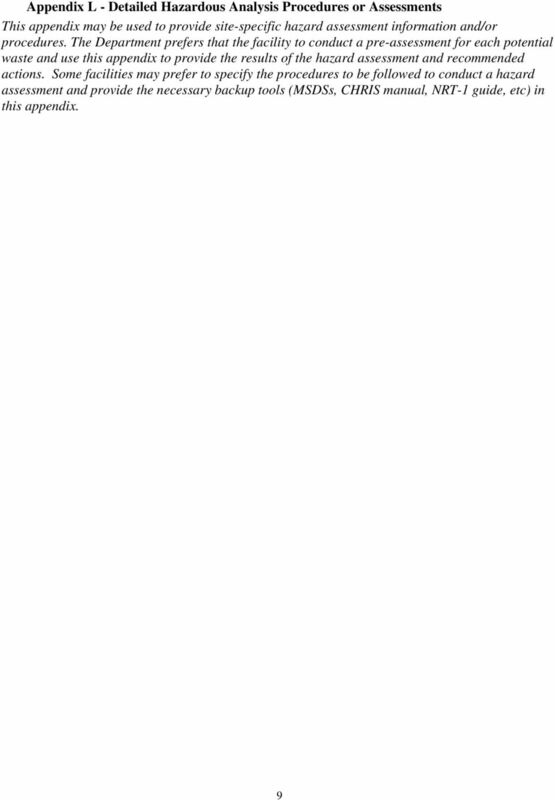 o Are all of the container accumulation start dates less than 90 days ago? 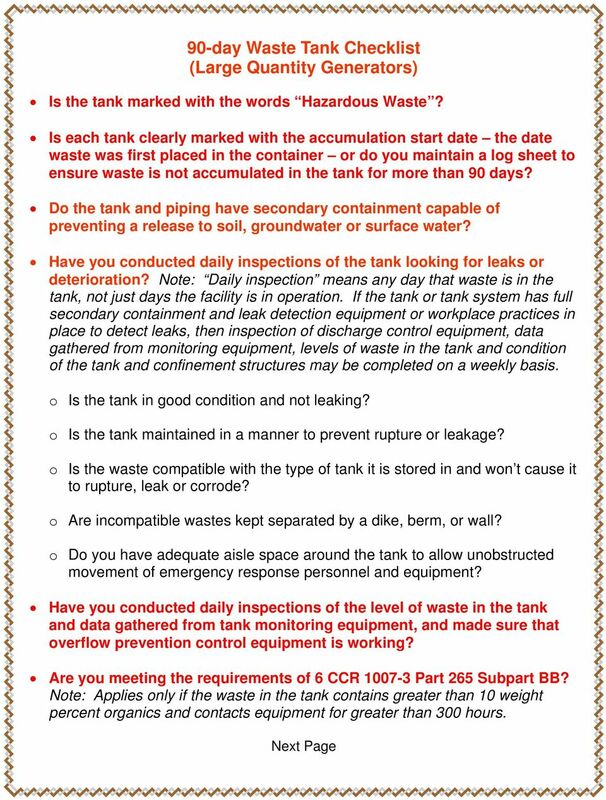 Have you conducted weekly inspections of the waste accumulation containers looking for leaks or deterioration? 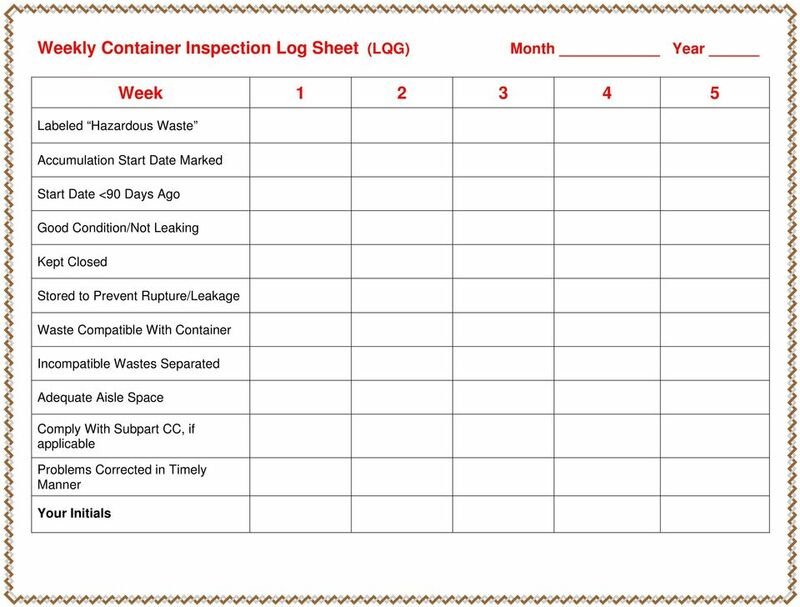 (complete the weekly inspection log) o Are all containers in good condition and not leaking? o Are all containers kept closed except when waste is being added or removed? o Are all containers stored in a manner to prevent rupture or leakage? o Is the waste compatible with the type of container it is store in and won t cause it to rupture, leak or corrode? o Are wastes that could react together kept separated by a dike, berm, or wall? o Do you have adequate aisle space around the containers to allow unobstructed movement of emergency response personnel and equipment? If any containers hold more than 26 gallons of wastes with organic concentrations greater than 500 parts per million by weight, are you meeting the requirements of 6 CCR Part 265 Subpart CC? Note: Subpart CC requirements only apply to containers in the 90-day area, not those in a satellite accumulation area. Did you correct any problems identified during the inspection in a timely manner? 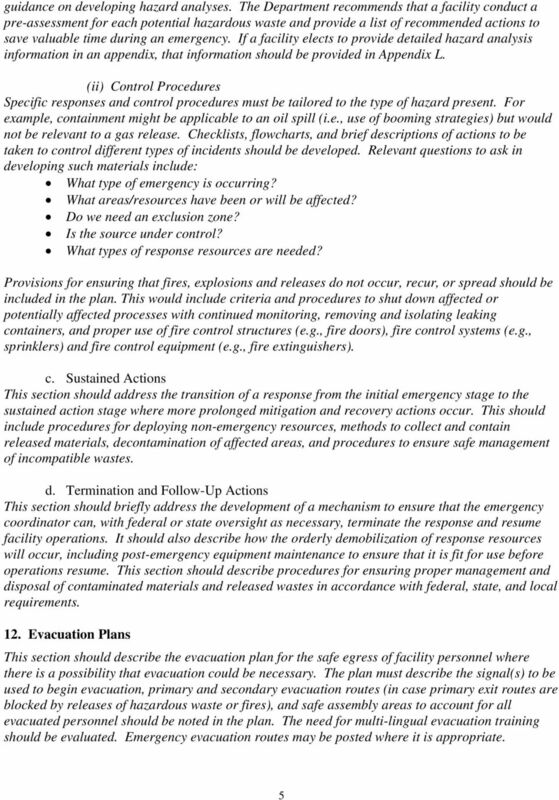 Are the locations of all permanent and temporary 90-day accumulation areas recorded in the facility contingency plan? 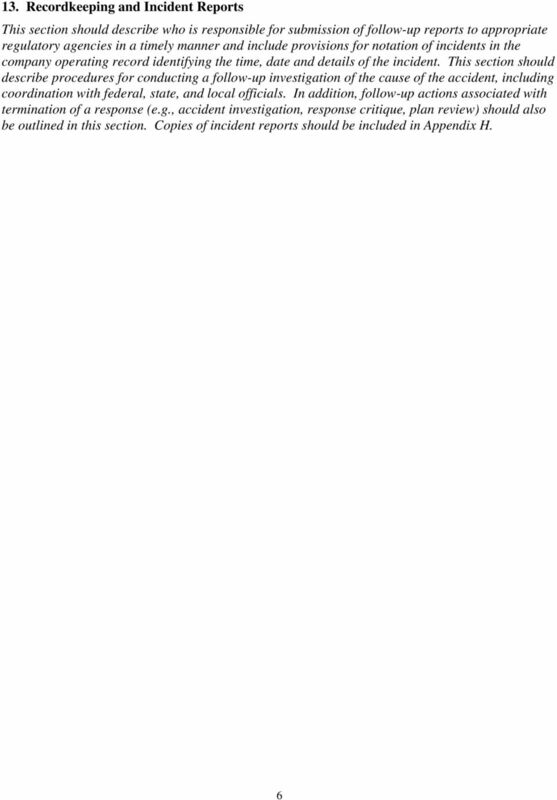 19 Are you meeting the requirements of 6 CCR Part 265 Subpart CC? Note: Applies only if the tank holds wastes with organic concentrations greater than 500 parts per million by weight. 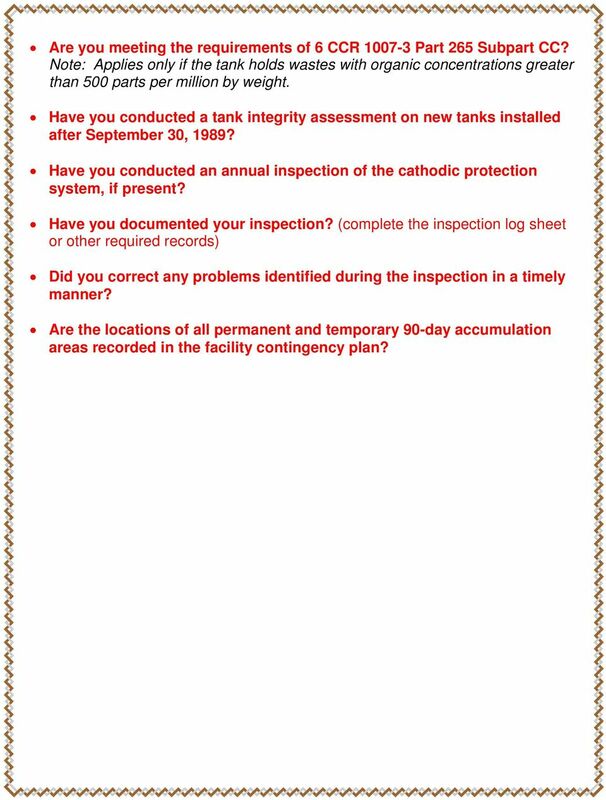 Have you conducted a tank integrity assessment on new tanks installed after September 30, 1989? Have you conducted an annual inspection of the cathodic protection system, if present? 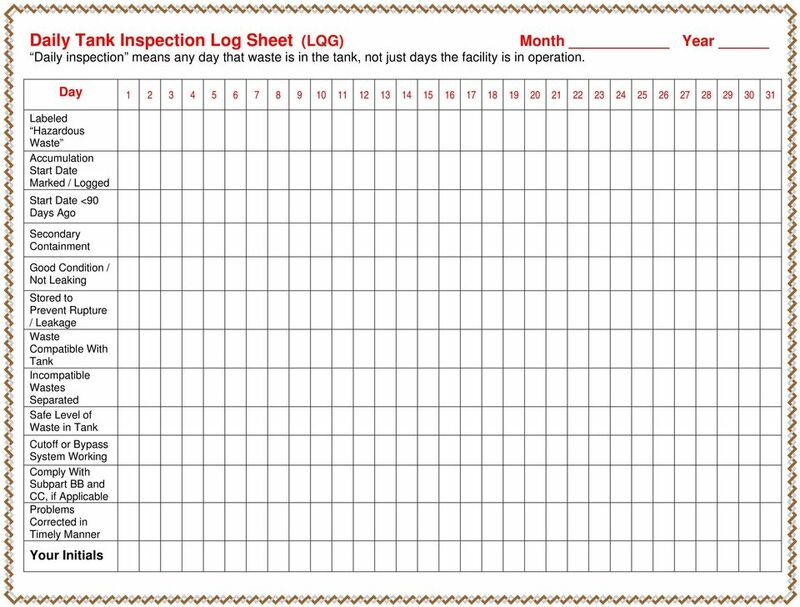 Have you documented your inspection? 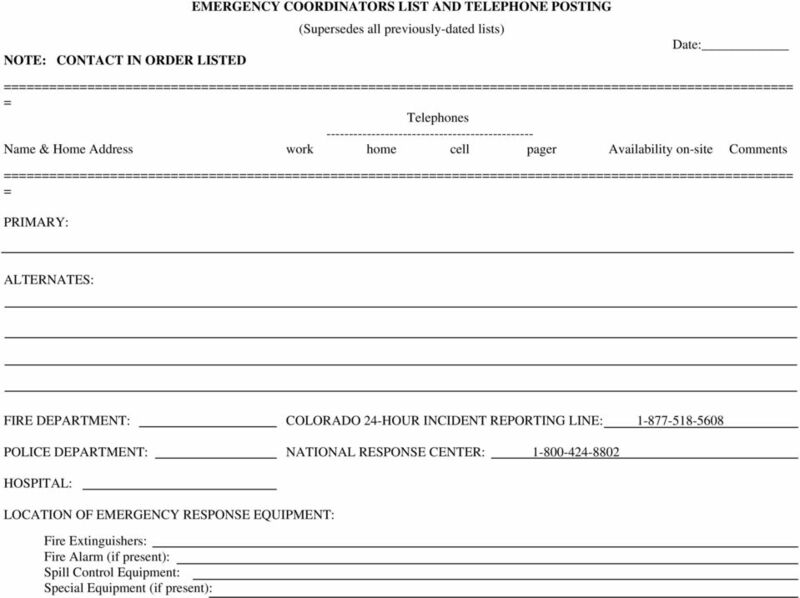 (complete the inspection log sheet or other required records) Did you correct any problems identified during the inspection in a timely manner? 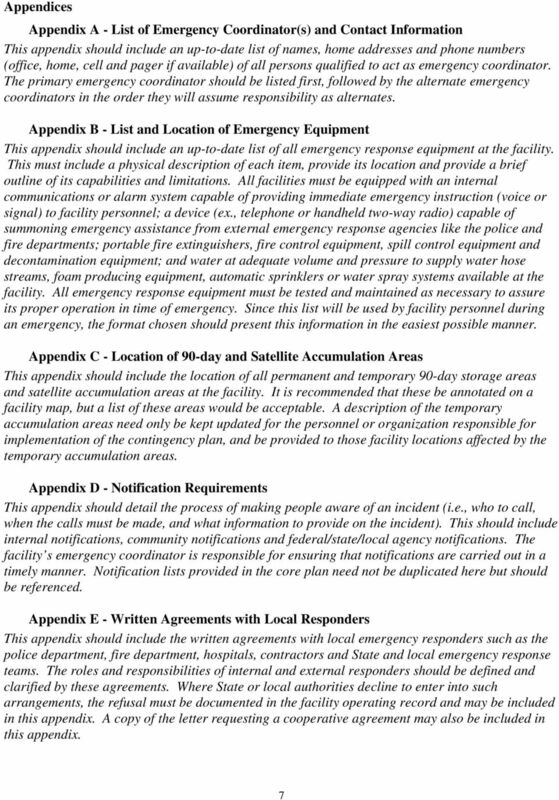 Are the locations of all permanent and temporary 90-day accumulation areas recorded in the facility contingency plan? 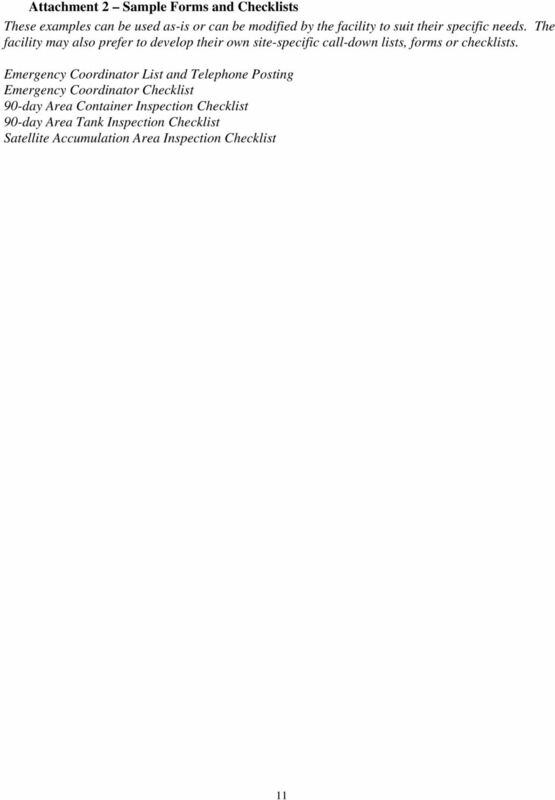 22 Satellite Accumulation Area Checklist (Large Quantity Generators) Is the total amount of waste stored in this area less than 55 gallons of hazardous waste and one quart of acutely hazardous waste? Is the satellite area at or near the point of generation with nothing that might interfere with the transportation of waste to the satellite area? Is the area under the control of the operator of the process generating the waste, either visually or under lock and key? Is the satellite accumulation container marked with the words Hazardous Waste or other words to identify the contents of the container? Have you conducted weekly inspections of the satellite accumulation container? (complete the weekly inspection log) o Is the container in good condition and not leaking? o Is the container kept closed except when waste is being added or removed? o Is the container stored in a manner to prevent rupture or leakage? o Is the waste compatible with the type of container it is stored in and won t cause it to rupture, leak or corrode? o Are wastes that could react together kept separated by a dike, berm, or wall? 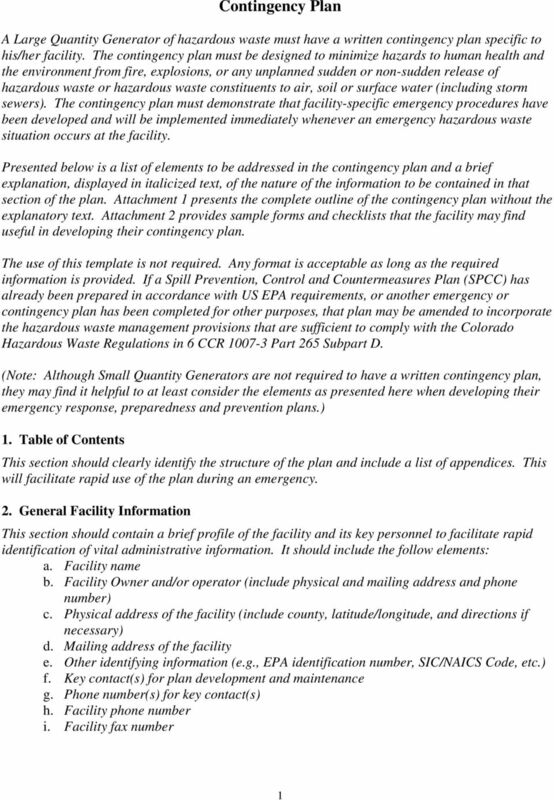 o If the container holds ignitable or reactive waste, is it located at least 50 feet from the facility property line? o Is there adequate aisle space around the container to allow unobstructed movement of emergency response personnel and equipment? 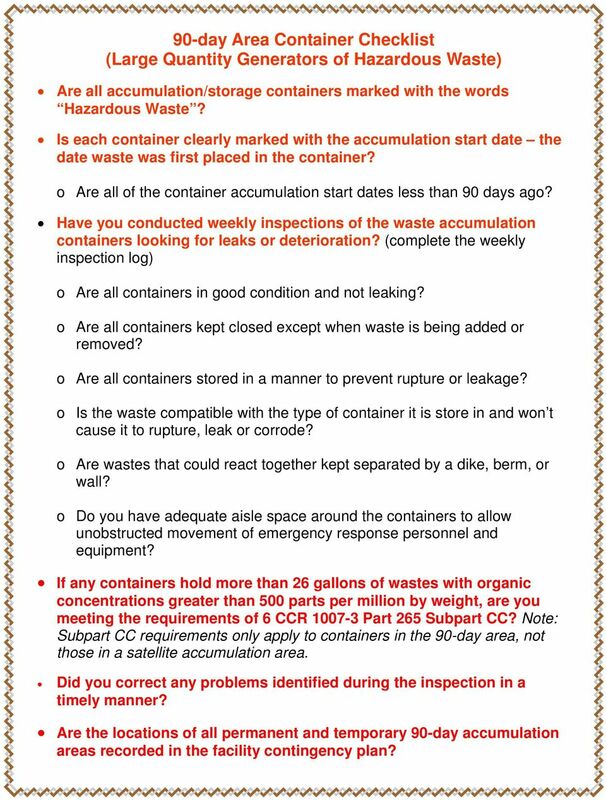 Is the container clearly marked with the accumulation start date as soon as (within minutes) the level of 55 gallons of hazardous waste or one quart of acutely hazardous waste is met? o Ensure the dated container is moved to the 90-day accumulation storage area within 24 hours. 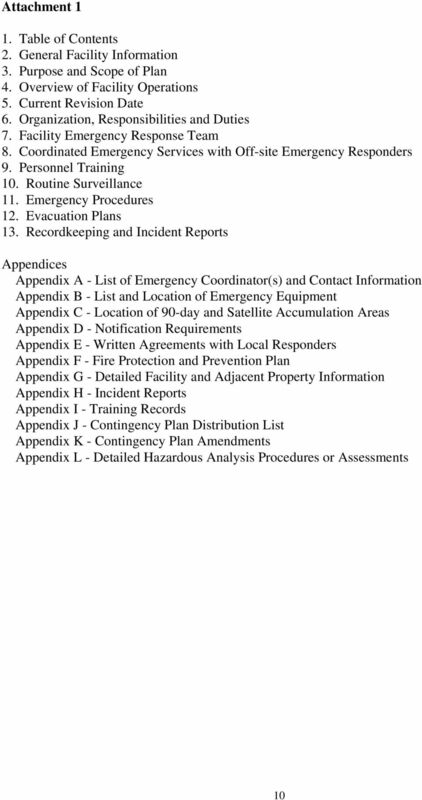 Are the locations of all the satellite accumulation area recorded in the facility contingency plan? 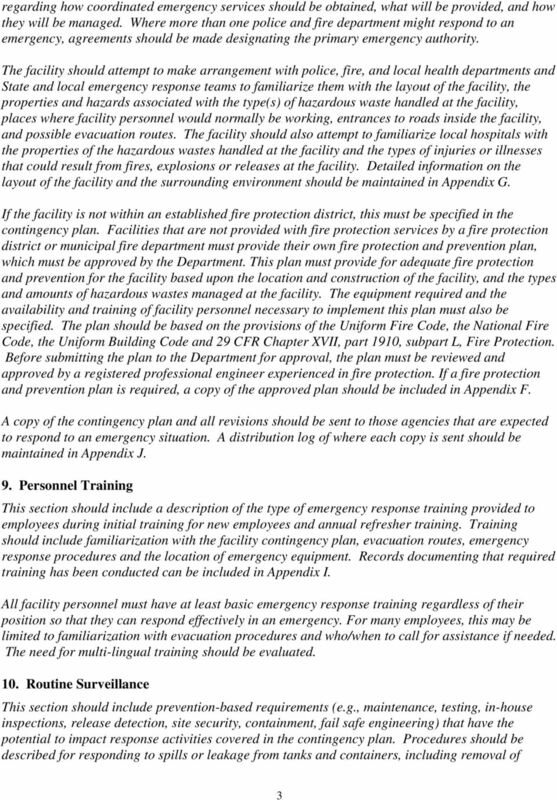 This plan, its contents, and emergency notification procedures shall be made available to all appropriate University employees. Decontamination of the victim. Protection of medical personnel. Disposing of contaminated protective equipment and wash solutions. PITTSBURG TANK AND TOWER CO., INC. 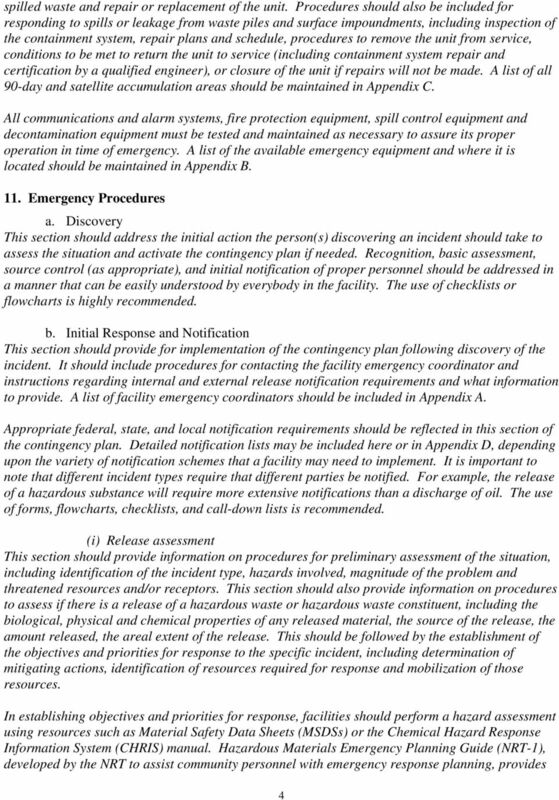 SECTION J ACCIDENT PREVENTION & EMERGENCY RESPONSE Describe the existing or proposed measures, including emergency procedures, to minimise the impact on the environment of an accidental emission or spillage. ALLEGANY WIND POWER PROJECT CONSTRUCTION SPILL PREVENTION PLAN Best Management Practices (BMPs) will be implemented during construction of the Allegany Wind Power Project to prevent and contain spills. An inventory of hazardous materials used in your workplace will prove useful. Objectives Cover Contain Educate Reduce/Minimize Description Raw materials, by-products, finished products, containers, and material storage areas exposed to rain and/or runoff can pollute stormwater.